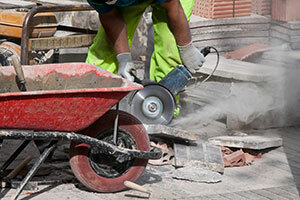 Provide employees using stonecutters and splitters with the knowledge, training, and equipment needed to reduce the risk of serious injuries on the job. • Has the safety of the machinery been evaluated? • Will any worker body parts be close to the cutting blades when the machine is being operated? • Does the material itself pose a hazard as it is being processed, such as flying rock chips or dust? • Does the machine have guarding and, if so, is the guarding easily bypassed or removed? • Does the guarding keep workers’ body parts out of the danger zone? Workers operating stonecutters and splitters could be at risk of amputations, cuts, abrasions, and serious injuries to the eyes, hands, and face. Help reduce these injuries and protect employees by providing the proper training and safety gear.